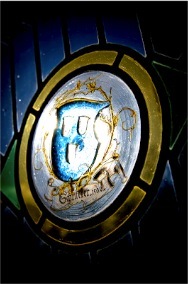 One of the numerous details of our stained glasses, located in several rooms of the chateau. First built under the shape of a “dwelling”, the prussians burnt the castle to ashes during their defeat in the 18th century. This caused the castle to remain ruins. Later in 1780, it’s August Bucquet, painter and architect, who built it again on the ruins of the first castle. Surely because he wanted to leave his mark in history, he writed his name on the castle’s front wall. Meanwhile, the castle gained new towers, et became the theater of criss-crossed destinies. Miller, baker, ferryman, wine-grower, are part of so many persons who lived in the castle, as show some physical and written proofs.